The pressure of Ashiatsu is constant and maintained. Barefoot massage creates circulation. More circulation brings about faster healing. Ashiatsu brings about a relaxed state. In fact, this state of well-being lasts for hours after a massage service. Clients don’t walk out of a session – they float. Ahh…shiatsu® Bar Therapy massage is a trademarked form of Ashiatsu Bar Therapy. We base this barefoot wonder on an ancient Ayurvedic practice of Chavutti Thirummal. In addition, our training classes and seminars combine Swedish, Myofascial, and compression techniques. The massage therapist applies their feet to the body of the client. Thereby, giving the hands and thumbs a rest. Ashiatsu is an art, where the feet glide over the contours of the client’s body. So, the pressure can be as light as a Swedish massage or the deepest massage a therapist can give. We change and adjust our course program to fit your needs. The workshop focuses on the hands-on technique of Ashiatsu. Also we do not claim that we own massage or invented it. Likewise, massage therapists are creative, intelligent, independent free-spirited thinkers. So we want to keep it that way. 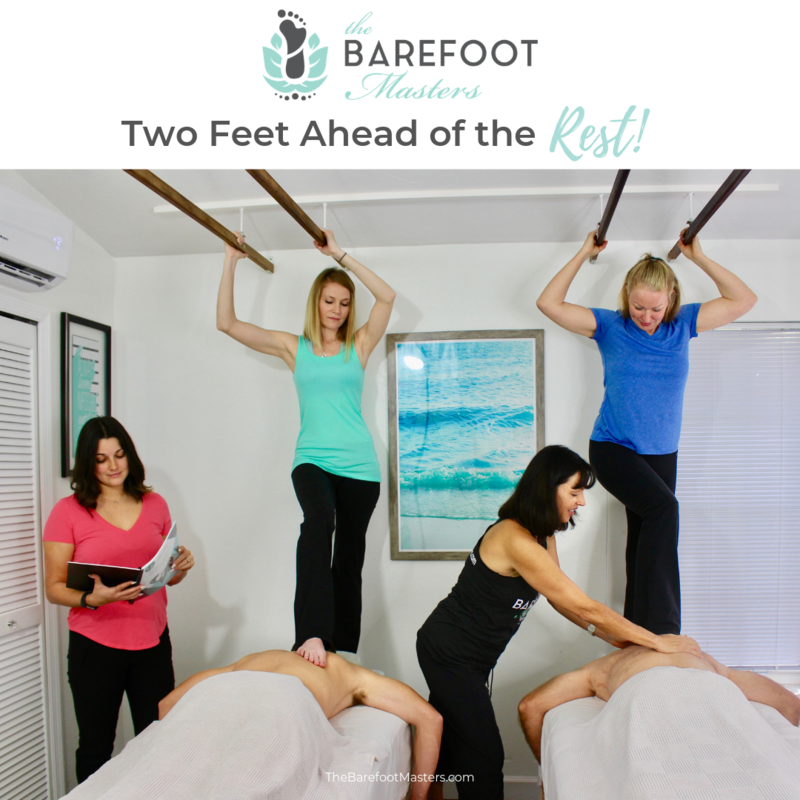 The Barefoot Masters® is the largest barefoot massage provider in the country. WHAT MAKES THIS PROGRAM STAND OUT? The overhead or floor Barefoot Bars are for balance and support. You do not have to have a lot of upper body strength to perform Ashiatsu. Furthermore there are no height or weight restrictions. The massage table must sustain both the weight of the client and the therapist. Ashiatsu treatments are a more efficient application of deep tissue massage. The first deep tissue of the day is as good as the last one. There is none of the usual pain associated with deep tissue massage for therapist or client. The therapist gains strength, knowledge, and grace. While at the same time adding diversity and vitality to their workday. So you can do more of what you love, forever. Ashiatsu training is an intensive and fun class. We dedicate this course to the preservation of the bodyworker. The Barefoot technique can feel very awkward in the beginning. DIGITAL MANUAL: The Ashiatsu course manual consists of pictures with descriptions. As well as instructions that cover the entire anterior and posterior routine. VIDEO: We view the video during the workshop as part of the course plan. We use most of the class training to hands-on application of Ashiatsu technique. LECTURE TIME: This time use is for discussing marketing and contraindications. The final part of the seminar is spent putting the routine together, so it flows. The trainee will perform a 20-minute practical on the instructor. We use this time to fine tune the movements, pressure, and placement of the application. The primary goal of the course is to ensure the success of every therapist in the class. Contraindications for the class are the following. Those who have had implant surgery for less than nine months or pregnancy. Cost for the class is $575 per person. We accept cash, check, and credit card payments. This fee includes digital course manual and instructional video! There is a $50. non-refundable fee for any cancellations. Half of the class fee is non-refundable 31 days before the workshop. And we apply all but $50. to a home study or another training date conducted by the same instructor within a year. Class size is 6. Please give at least one-month cancelation notice. As there is typically a waiting list of others that could take your spot given enough time to prepare. This class is a 20 hour CE course over a 2-day session; hours are from 8:30 am to 7pm for day one, then 8:30 am to 7 pm for day two. Also, there are breaks during class, but, please come to class well rested! Trainees need to bring snacks. A refrigerator is available for drink storage. On day-one, we will eat lunch out and discuss marketing over the meal. Bring one fitted sheet, face cradle cover, and one over-sized heavy towel for draping. Therapists need to have their feet pedicured and wear no toe or ankle jewelry. You may want to bring a pair of house shoes to wear while training to keep your bare feet off the floor. Therapists, please wear loose, comfortable clothing. In addition, yoga capris or pants work best; if you wear yoga pants, we’ll roll the pant legs up to the knee. Men find basketball shorts or sweatpants to be most appropriate. For more information on the Ashiatsu Bar Massage training class read our Blog. Ashiatsu Massage or Fijian Barefoot? What’s the Difference? Why Not Offer Portable Ashiatsu Bar Mobile Massage? Can Massage Therapists Do Facials?